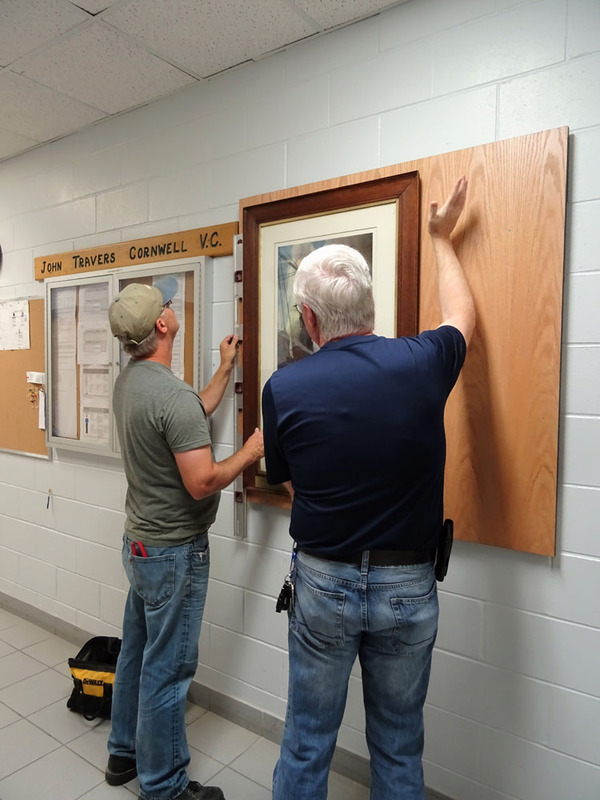 Since the restoration and rededication of the Cornwell at his Gun print back in 2016 (see full story), the Alumni has been looking for a permanent home for the print. 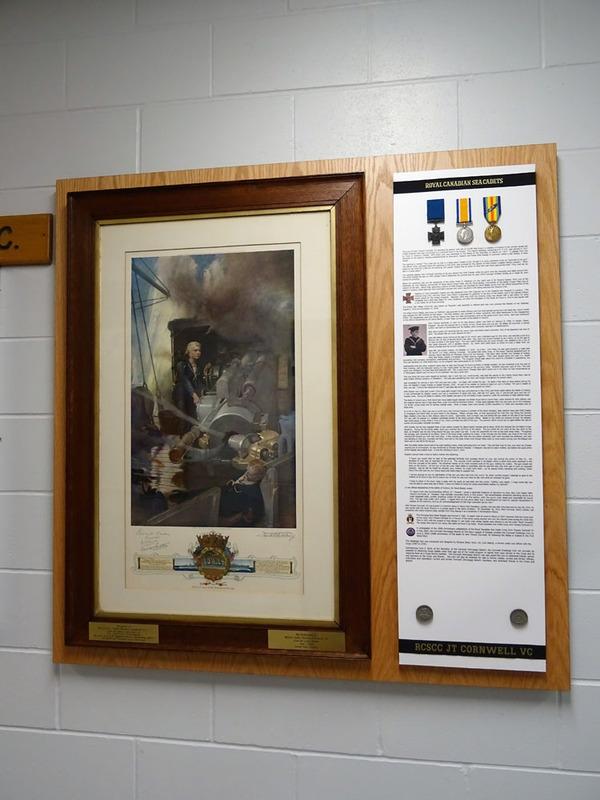 It spent the month of June 2016 on display at the Winnipeg Centennial Library and since then has been on display at the Manitoba Naval Museum at HMCS Chippawa (see full story). 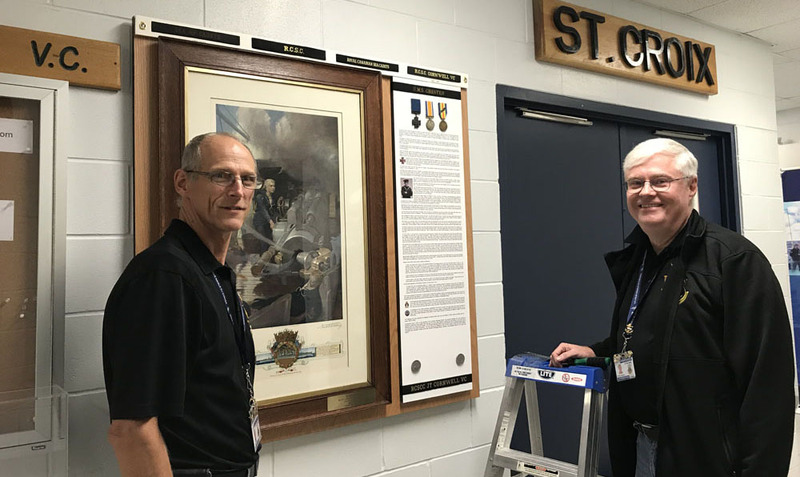 Larry Schenkeveld, Cornwell (Winnipeg) Branch President, initiated the process that would ultimately result in a permanent home at HMCS Chippawa. 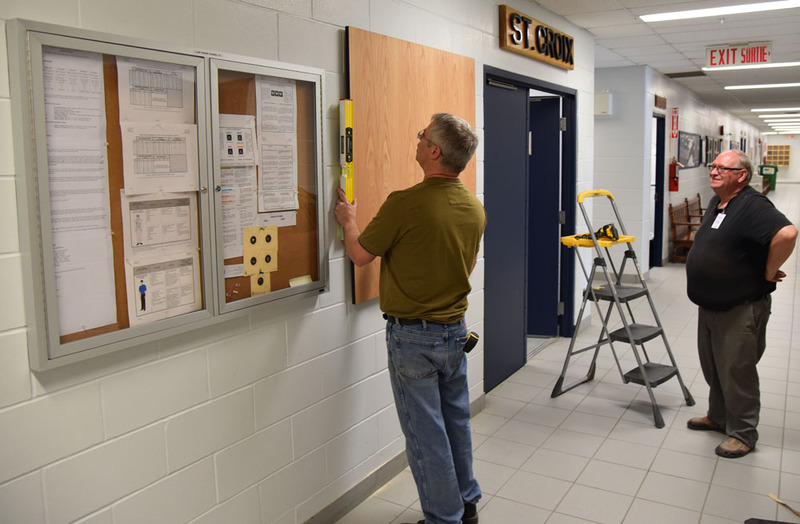 Larry’s conversation with PO John Tanchyk, HMCS Chippawa’s Buffer and JTCVC Alumni, started the ball rolling. 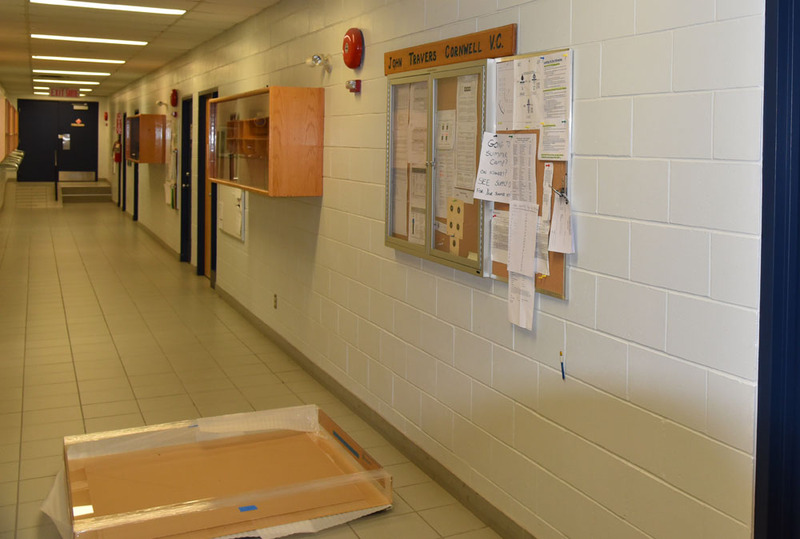 John Jamieson, JTCVC Alumni President, picked it up from there and negotiated with LCdr. 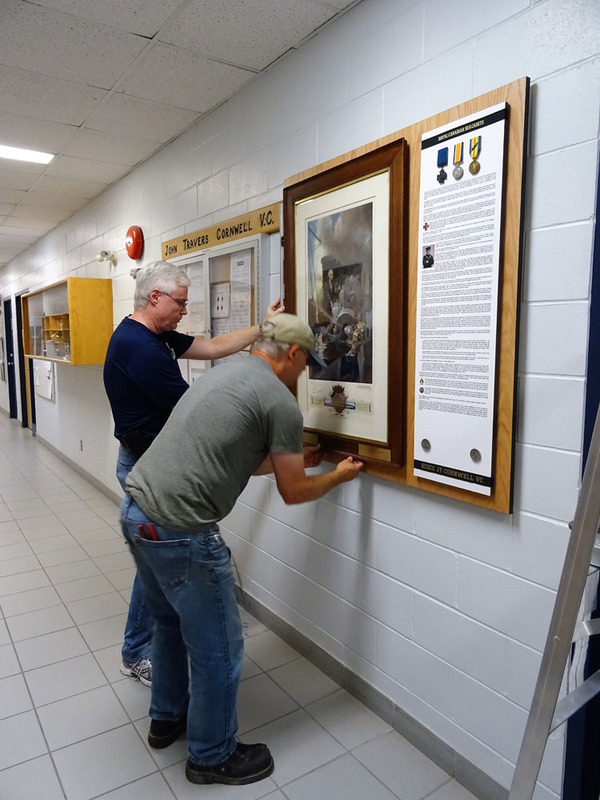 Ian Gillis, HMCS Chippawa’s Commanding Officer, who granted permission for the Alumni to hang the Cornwell at his Gun print on the walls of HMCS Chippawa permanently. 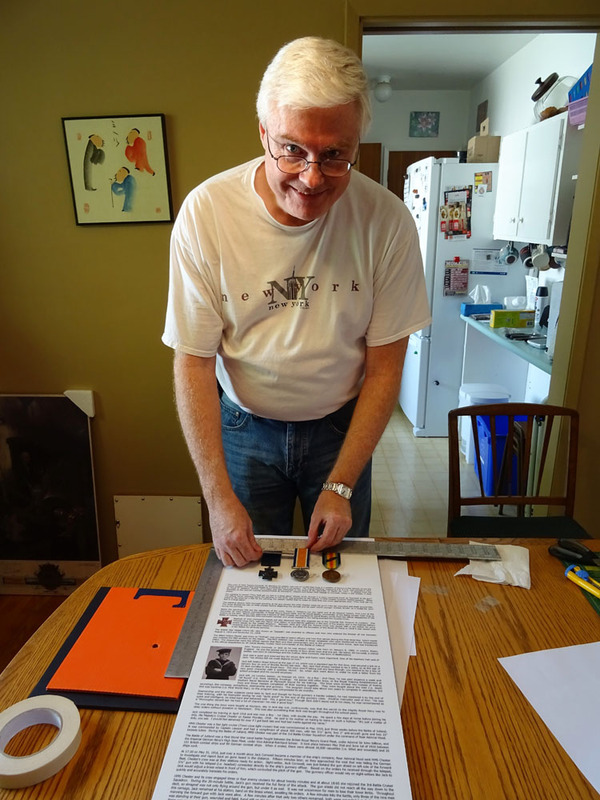 Phillip Bingham, Alumni Webmaster, join the effort to design the display case and create the storyboard that would accompany the Cornwell at his Gun print in the new display case. 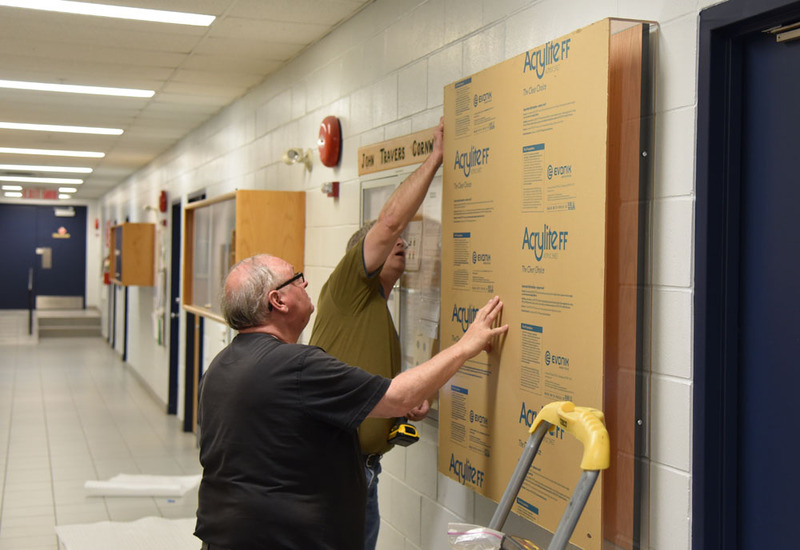 Once permission had been received and the design created, the Alumni solicited the assistance of Peter Menge, of PDM Custom Design, in the construction of a plexiglass case for the print. 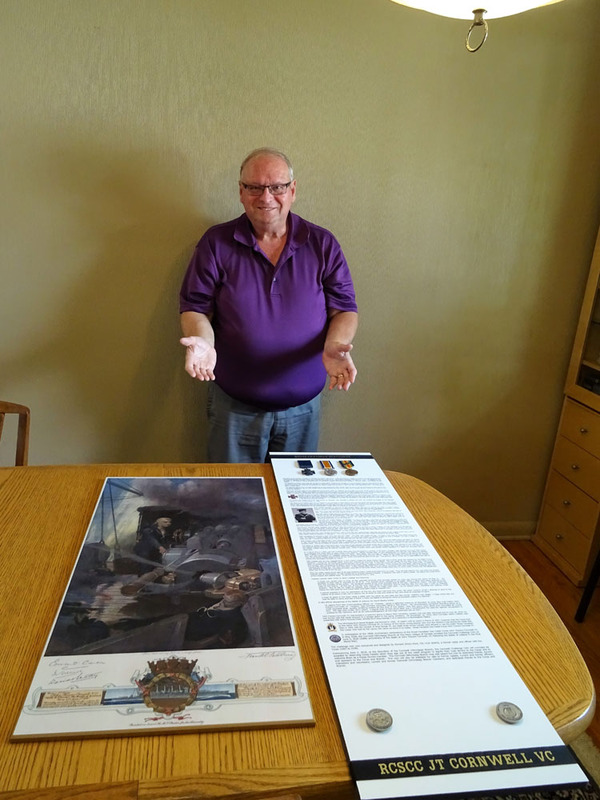 Peter, who has done considerable work for the Manitoba Naval Museum, took on the commission and constructed a spectacular case to house and protect our print for may years to come. 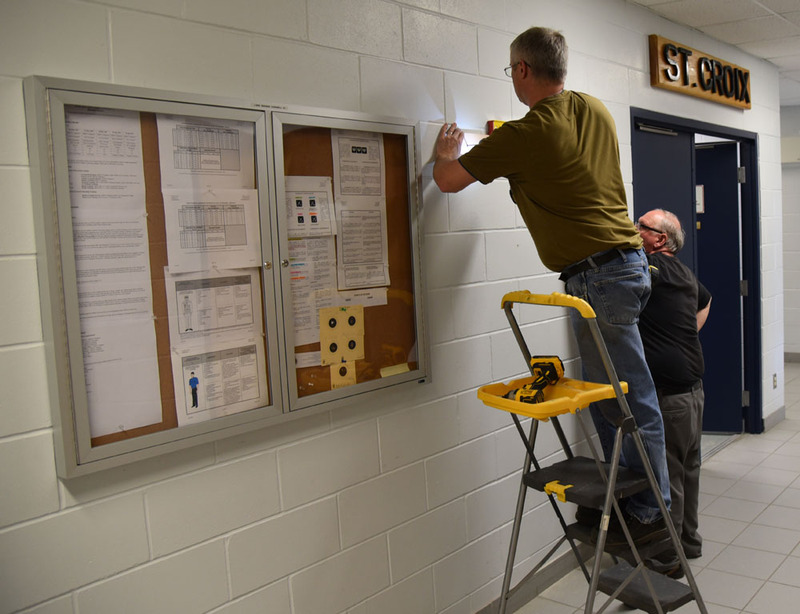 On May 24, 2017, Peter, with a little help from John and Phillip, installed the case on the wall across from the CO’s and XO’s offices (beside the JTCVC bulletin board) in HMCS Chippawa. 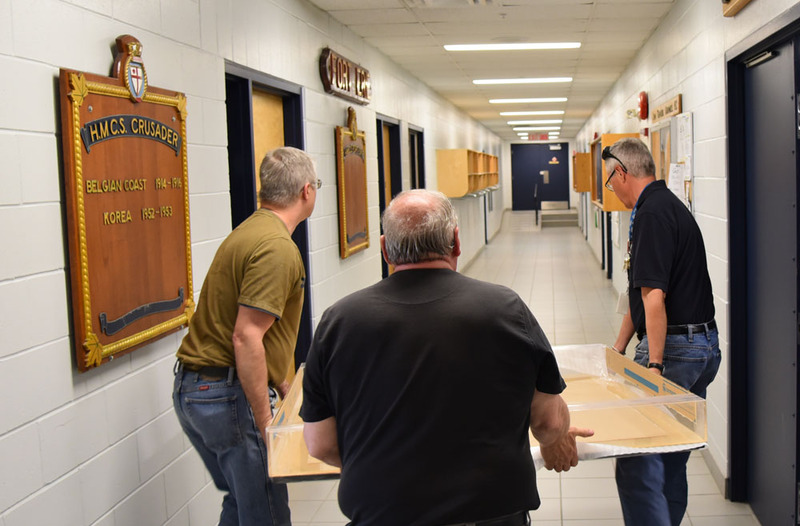 The case remained empty until the end of August 2017, when the Cornwell at his Gun print's term at the Manitoba Naval Museum ended. 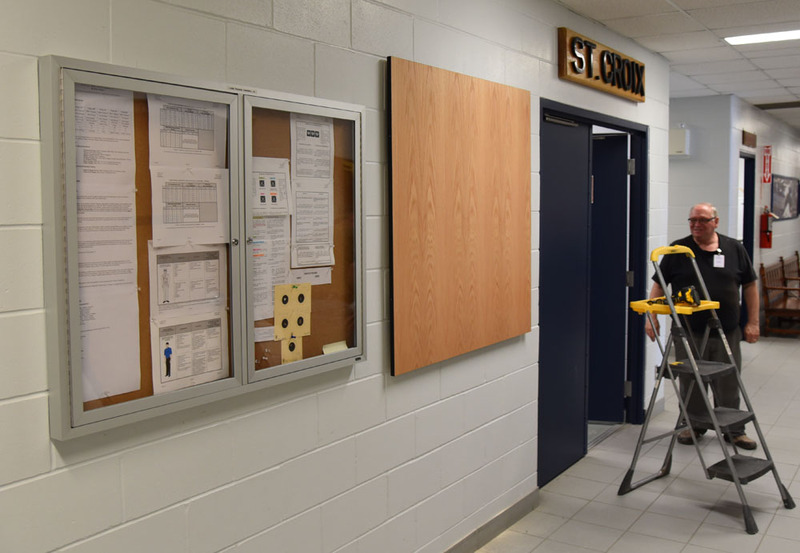 Display case after installation complete at HMCS Chippawa, May 24, 2017. 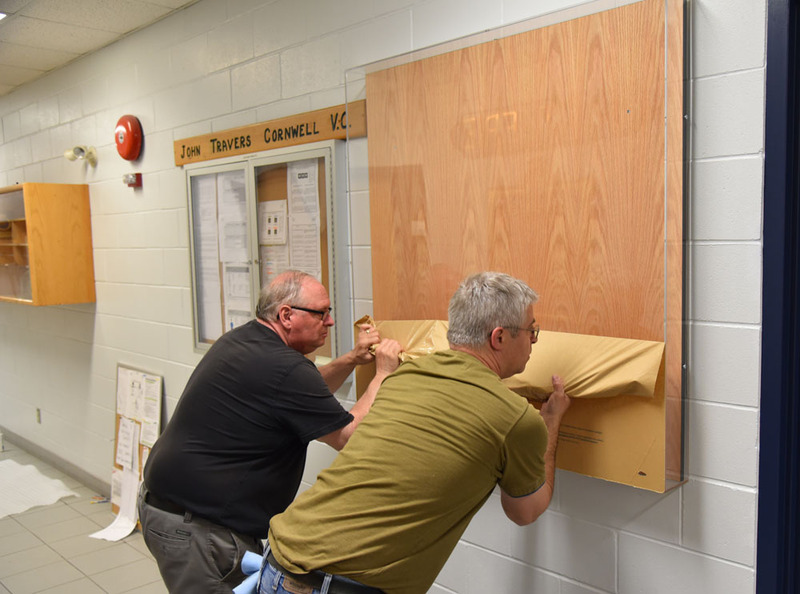 During the summer John and Phillip worked on having the storyboard printed and mounted, and installing Jack Cornwell's replica medals and the JTCVC Alumni Challenge Coins on the storyboard. Then on September 6, 2017, with the permission of HMCS Chippawa’s new Commanding Officer, LCdr. 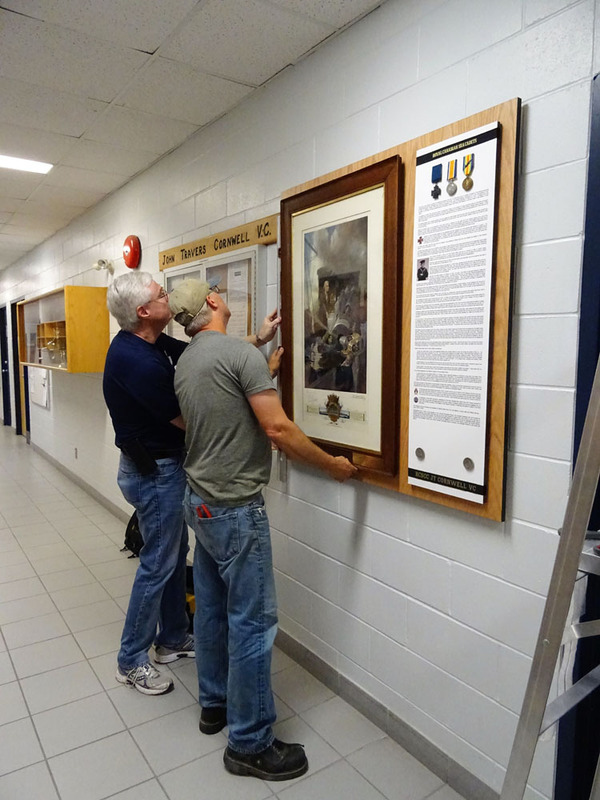 Colin Stewart, Peter returned to install the Cornwell at his Gun print and the new storyboard in the display case. 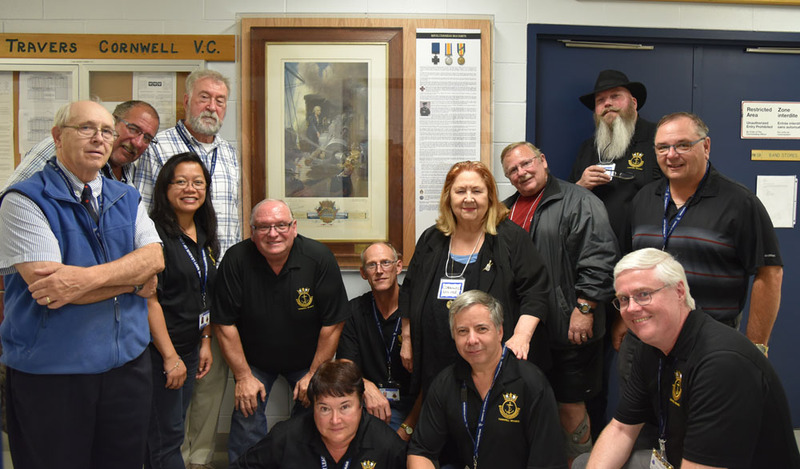 The following day, Thursday, September 7, 2017, the Cornwell (Winnipeg) Branch and the JTCVC Alumni presented the completed display to the Corps; kicking off a new Cadet Year. 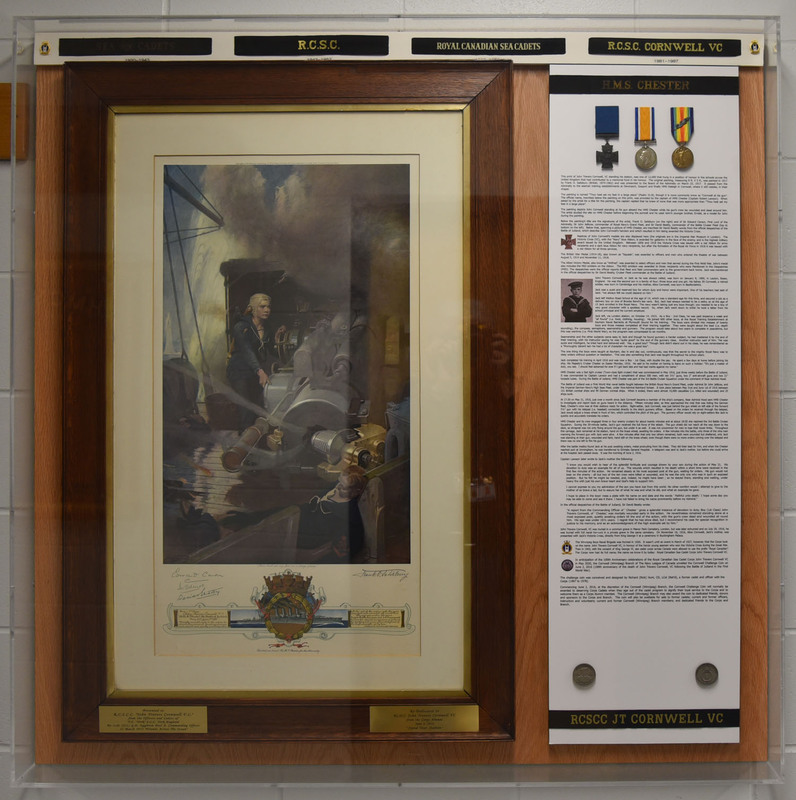 Display case after installation of Cornwell print and storyboard at HMCS Chippawa, September 6, 2017. 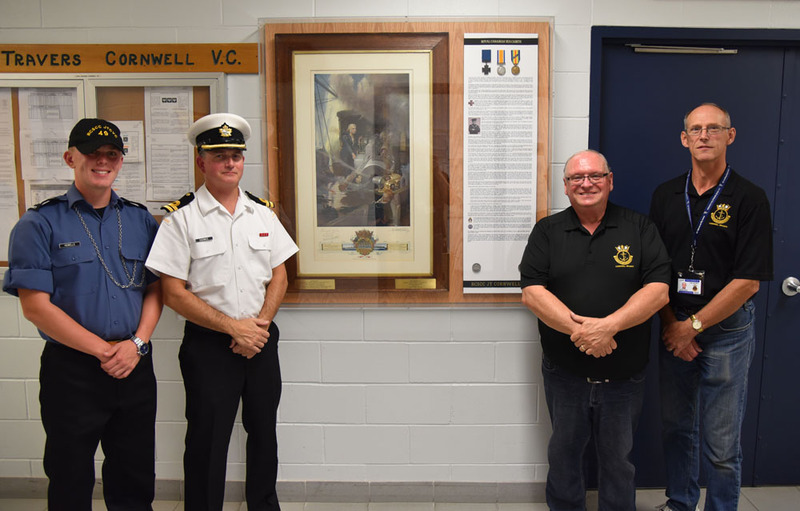 Branch & Alumni present the completed display to the Corps at HMCS Chippawa, September 7, 2017. 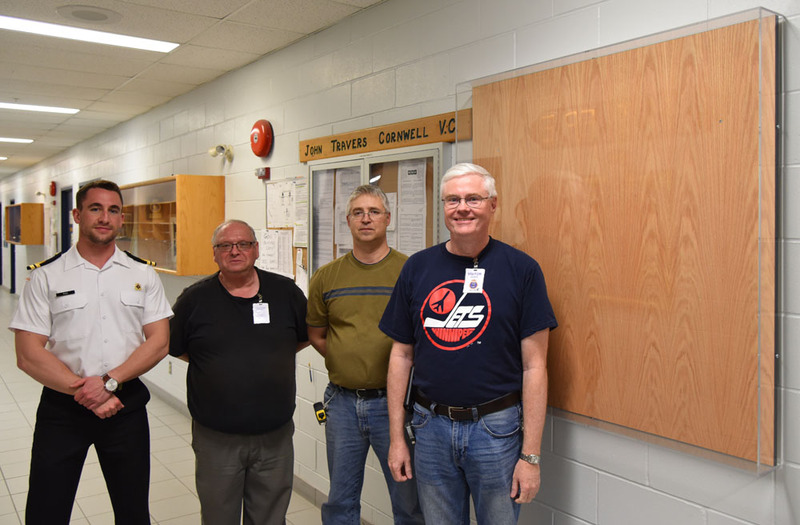 Cornwell (Winnipeg) Branch with the completed display at HMCS Chippawa, September 7, 2017. 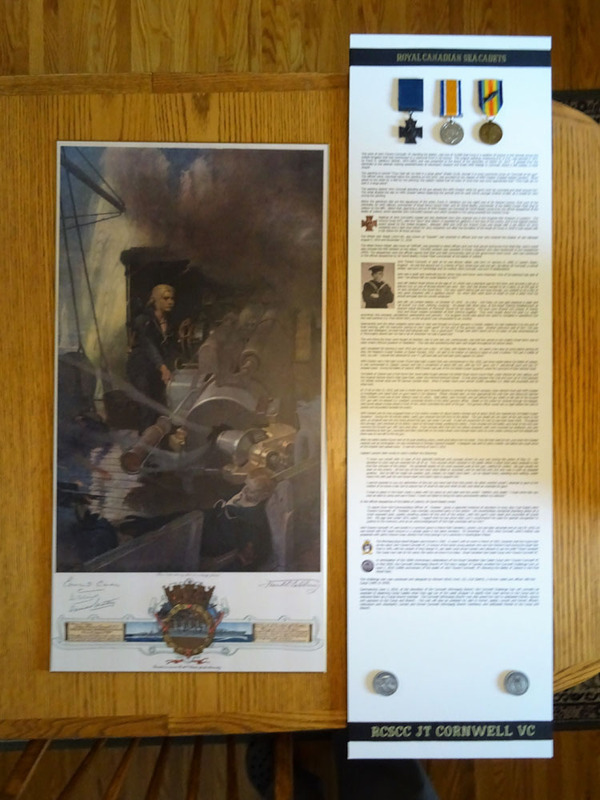 A hardy Thank You goes out LCdr. Gillis, LCdr. 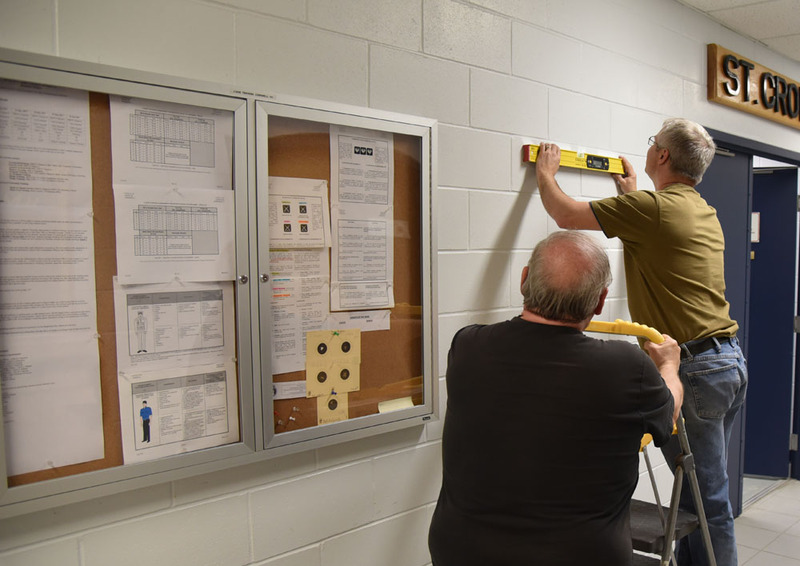 Stewart, Lt(N) Ridd, PO Tanchyk, Mr. Schenkeveld, Mr. Jamieson, Mr. Bingham, Mr. Menge and the Manitoba Museum staff for all their hard work in making this a reality! 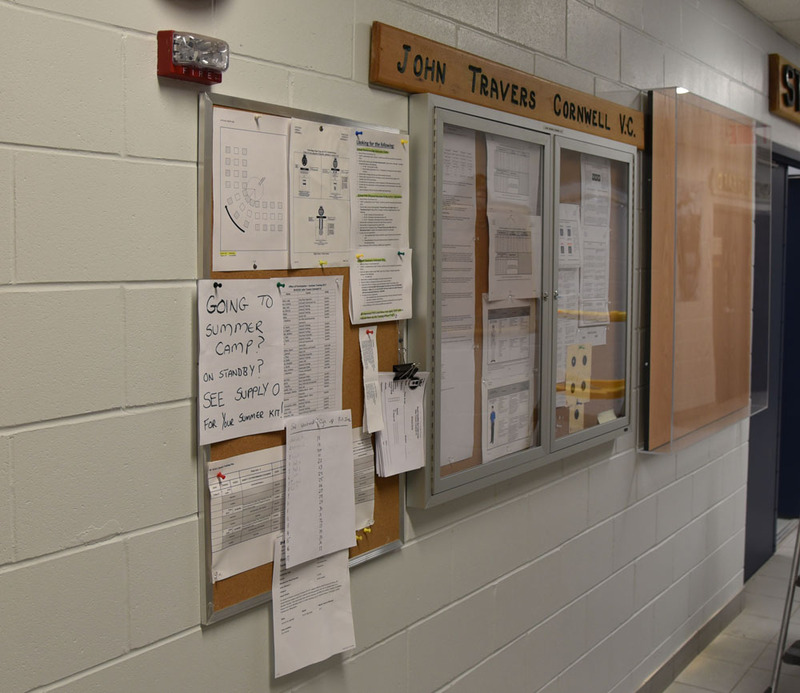 The JTCVC Alumni is currently looking for an HMS Chester cap tally to display above Jack Cornwell's replica medal, to replace the Royal Canadian Sea Cadet cap tally currently displayed. 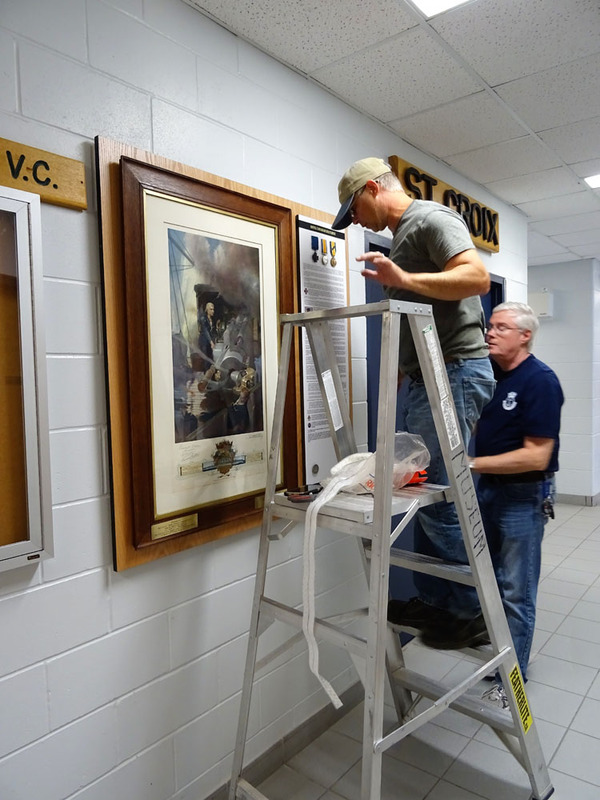 In addition, next year the JTCVC Alumni will add the 100th Anniversary Commemorative Coin to the display (in between the two JTCVC Alumni Challenge Coins currently displayed). 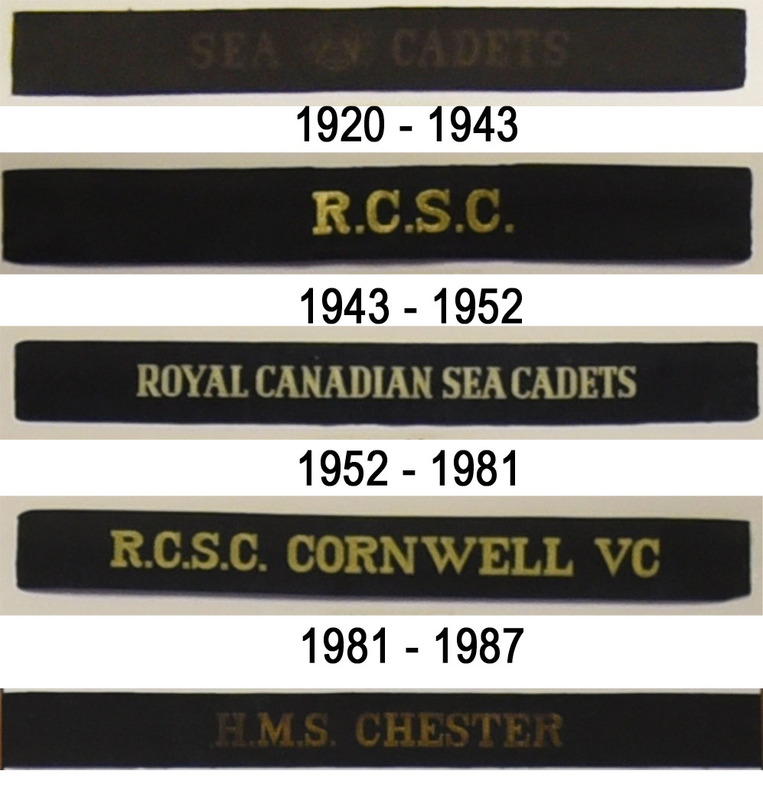 Over the years the Cadets of RCSCC John Travers Cornwell VC have worn several different cap tallies. 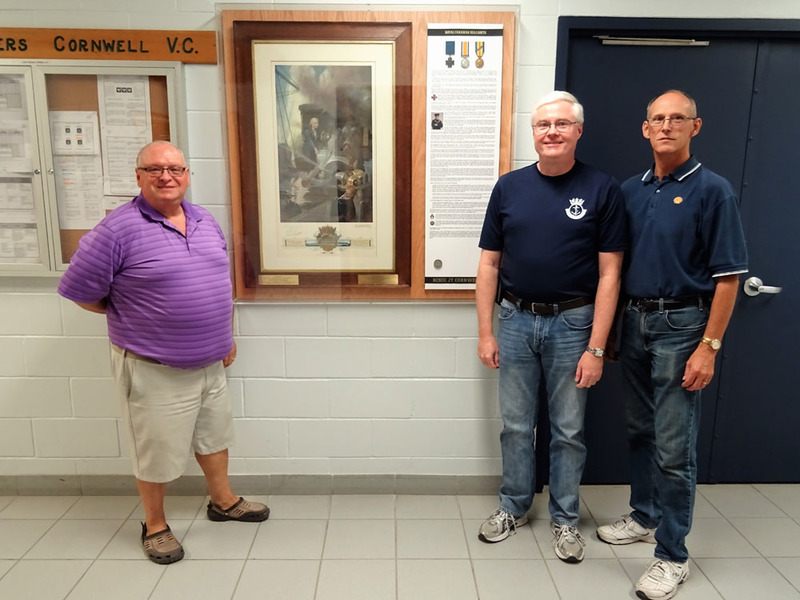 On Thursday, September 20, 2018, Phillip Bingham, John Jamieson and Don Bullee added some of those cap tallies to the Cornwell at his Gun display. Three of these cap tallies were donated by Jack Templeman, former Corps Commanding Officer. They included original H.M.S. Chester, Sea Cadets and R.C.S.C. Cornwell VC cap tallies. The other two cap tallies were donated by Phillip Bingham. They included an original Royal Canadian Sea Cadets and a replica R.C.S.C. cap tally. The H.M.S. 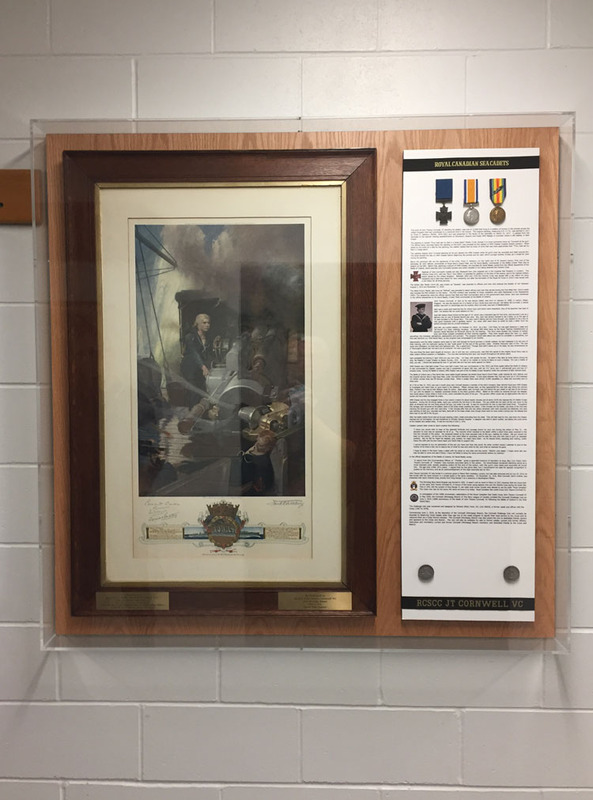 Chester took its place above John Cornwell's replica medals, atop of the storyboard (replacing the Royal Canadian Sea Cadets cap tally). The four Corps cap tallies were mounted at the top of the Cornwell at his Gun display. They join the cap tally that is currently being worn by Cadets of our Corps, which mounted at the bottom of the storyboard. Thanks to Jack Templeman, Phillip Bingham, John Jamieson and Don Bullee for their donations and assistance mounting these valuable additions to the Cornwell at his Gun display! 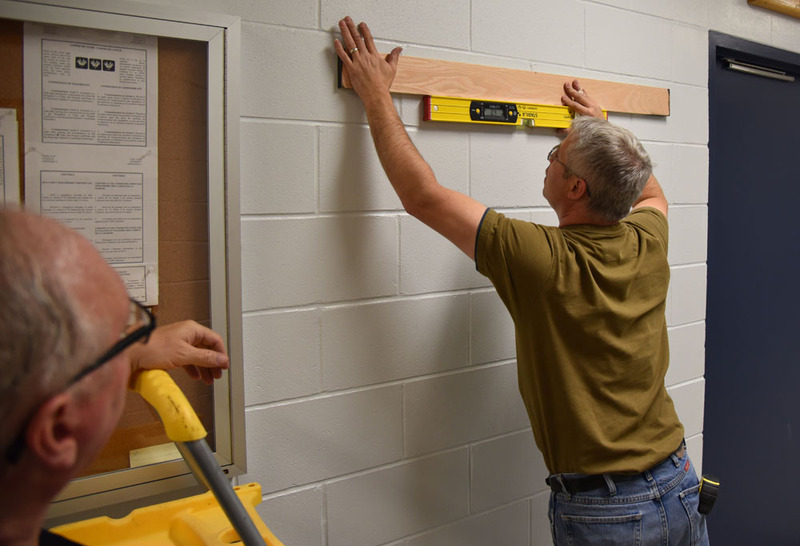 Adding cap tallies to the display at HMCS Chippawa, September 20, 2018.